Amazon, along with 10 other Washington-based companies, scored 100 percent this week in the Human Rights Campaign Foundation’s latest measure of policies and practices that “affirm and include” lesbian, gay, bisexual, transgender and queer (LGBTQ) employees. But even as Amazon was again lauded by the Human Rights Campaign, another LGBTQ advocacy group urged the company to speak out against a slate of anti-LGBTQ legislative proposals in Tennessee, where it plans to add some 5,000 jobs at a new operations hub in Nashville. The group, No Gay? No Way!, this week ran digital and print ads in publications in Washington, Virginia and Tennessee and drove a mobile billboard around Amazon’s headquarters buildings in Seattle, a spokesman said. It plans to fly a banner from a plane in Nashville next week. 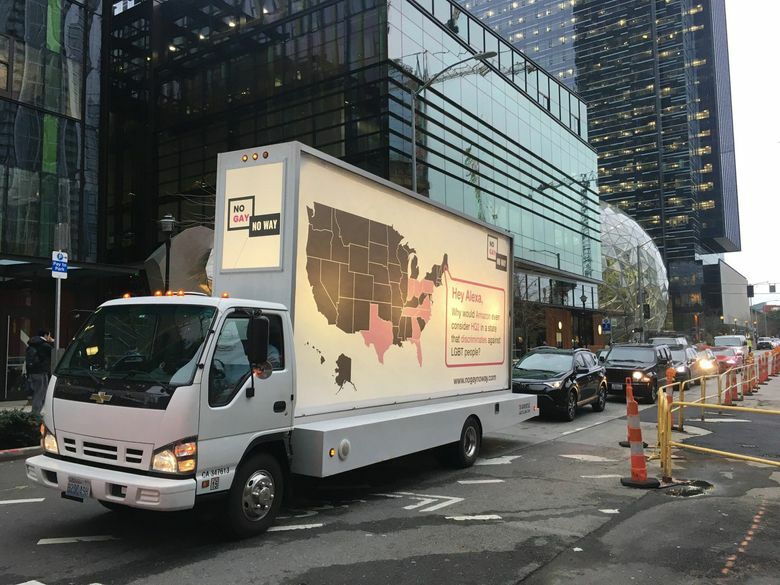 The group ran a similar campaign in February 2018, asking Amazon why it was considering states that discriminate against LGBTQ people as part of its HQ2 search. “Amazon has a long history of supporting equality and we’re opposed to laws that discriminate or encourage discrimination,” an Amazon spokeswoman said in a statement to The Tennessean newspaper Wednesday. While Amazon’s statements may not satisfy No Gay? No Way! — which wants Amazon to take a more active role opposing the Tennessee legislation and fund groups doing the same — the company has taken a stand on other LGBTQ legislative issues. It was one of many to join the Human Rights Campaign’s business coalition supporting a federal Equality Act, which would add protection for LGBTQ people to several federal civil rights and employment laws. Founder and CEO Jeff Bezos and his wife MacKenzie (from whom he announced a divorce in January) were major financial supporters of Washington’s successful marriage equality ballot initiative and also won the organization’s Equality Award in 2017. Last year Amazon also earned a perfect score in the HRC (Human Rights Campaign) Foundation index. The other state companies with a score of 100 percent in the index are WE Communications, Microsoft, Slalom, Lane Powell, Perkins Coie, Fortive, Nordstrom, Starbucks, T-Mobile US and Expedia Group. Several other companies scored 90 percent or above, including Recreational Equipment Inc., Brooks Sports, Davis Wright Tremaine, Zillow Group, Weyerhaeuser, Washington Permanente Medical Group and Alaska Airlines.